Plants, stone, and wood are the core ingredients of most landscapes. Other ingredients, like concrete and plastic (ugh) show up often as well. The ingredient you should be adding? Steel is fantastic in landscapes. It is a versatile material, which is what custom landscape designs demand. Steel ages really well, taking on a natural patina that fits with your garden's core ingredients. So how, exactly, do we work some steel into your landscape? Glad you asked! Landscape edging is used to create paths and patios, make lawn edges sharp and easy to maintain, and keep pavers in place. Plastic edging is common, probably because it is light and can be rolled up. I realize you can't pick up a 20' long stick of steel edging, but you can have it delivered. Steel edging stays in place and naturally gives your landscape elements attractive contours. Wondering where to get it? Try Eastside Steel and tell them we sent you. 2- Corten steel pots and planters. Corten steel is a kind of "weatherized" steel that is essentially sealed by the rust it naturally develops. The natural tones of corten are a great foundation for plants. Looking for steel planters? You can get them fabricated locally or order and assemble these ones from Nice. Steel holds up to heat and weather very well, making it perfect for fire pits. Stainless steel fire pits, like the Bonfire, work well in a formal or traditional landscape. 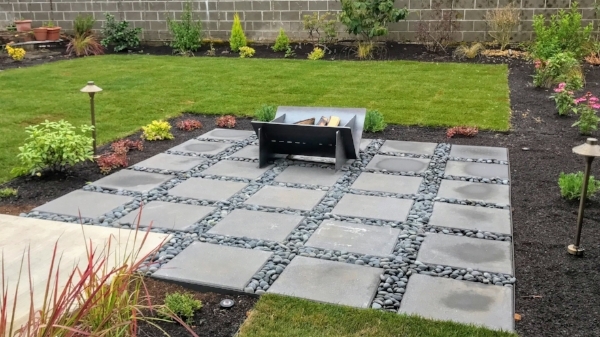 Raw steel, like the fire pits from Forma Goods and Stahl (both local to Portland) would look amazing in your modern or Japanese garden. What about steel retaining walls? I get enquiries about steel retaining walls frequently. This is not surprising, because they are awesome. However, we have not yet built any. Why not? A retaining wall built with Oregon mild steel will be very expensive. The same wall out of corten will be twice as very expensive. If the wall is going to be over 48" tall, including the footing or if it bears a surcharge it needs to be permitted and engineered. Permitting and engineering a retaining wall in a place ripe for an earthquake is not for the faint of heart. Doing the same thing with an unusual material? Even more daunting. Still interested in a steel retaining wall? Please let me know, we would LOVE to do one. Have any questions about using steel in your landscape? Want to hire a designer comfortable using steel? Contact us today and schedule a free consultation.